SAITAMA - Urawa Reds boss Mihailo Petrovic insists he will be taking nothing for granted when the J. League leaders take on Western Sydney Wanderers at home on Wednesday in the Asian Champions League, despite looking a strong bet to get the result they need to book a spot in the knockout phase. Reds hammered 2014 ACL champions Wanderers 4-0 away in their opening game of the group phase back in February and with two games left to play, they only need a draw against the Australian A-League side to advance to the two-leg round of 16. Reds top the Group F standings with nine points. China’s Shanghai SIPG also have nine points while South Korea’s FC Seoul and Wanderers have three points each. 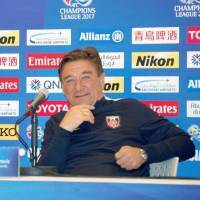 Speaking on the eve of the match at Saitama Stadium, Petrovic said, “There is not that much difference (in quality) between the teams and I think you could even say this is a group of death. Although second place will be good enough to see Reds advance, Petrovic wants to go through as Group F winners. The winners of Group F face the runners-up of Group H, which features Gamba Osaka. Gamba are currently bottom of Group H on three points but only one point behind second-place A-League side Adelaide United, who they faced at home on Tuesday. The Group F runners-up will take on China’s Jiangsu, who have already secured top spot in Group H.
Wanderers lost their last game 3-2 at home to Seoul, having beaten the South Koreans by the same scoreline away on March 15. Their domestic season ended when they were eliminated from the A-League playoffs on Friday by Brisbane Roar, losing 6-5 on penalties after a 1-1 draw. “I think they (the players) have recovered physically quite well (from the defeat),” said Wanderers coach Tony Popovic. “We had concerns mentally how the players could recover psychologically after losing in a penalty shootout in a playoff. Having been beaten so soundly by Urawa at home, Wanderers will need to chase goals to keep alive their hopes of progressing in the competition. “I think when you look at the table, our goal difference is not very good but if you come out with an approach of being careless in terms of our structure, a good opponent like Urawa will punish you,” said Popovic, who played in Japan with Sanfrecce Hiroshima from 1997-2001. Reds, the 2007 ACL champions, lost in the round of 16 last year to Seoul, going out 7-6 on penalties after the tie finished 3-3 on aggregate.